Mud paraffin treatments are special blends of muds chosen for their healthy benefits which are added to ultra clean paraffin wax. 6lb blocks. 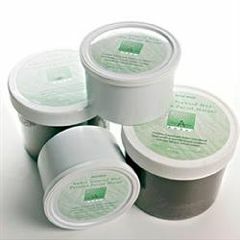 Seaweed Mud Paraffin - A unique blend of Algea, Kava Kava, Kelp, Comfrey extracts and selected silts are infused into extra filtered paraffin to moisturize, calm, and heal dry, irritated skin. Excellent for inflamed, under nourished skin. Sedona Mud Paraffin - Mineral rich Sedona Mud, Marshmallow, Bladerwrack and selected silts are infused into extra filtered pure paraffin creating a masque extremely effective in improving circulation and drawing out impurities. Leaves skin looking radiant and healthy.